Urban Corps is a team of Akronites dedicated to the growth and vibrancy of downtown Akron. Downtown retailers are a must-add to your shopping list. Call 330-706-7383 for lockouts, jumpstarts, safety escorts or cleaning assistance. 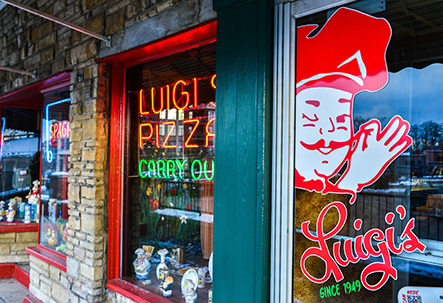 Luigi’s, an Italian Restaurant located in Downtown’s Northside, and is an Akron favorite that’s been around for over 55 years. Read the latest news and press releases. The Summit County Historical Society has set its 95th annual meeting for Thursday, April 25, at the Summit Artspace at 140 E. Market St. Recently retired Akron Beacon Journal editor Bruce Winges will be the speaker. Lock 3 opens its 2019 summer season with the first Rock the Lock concert, presented by WONE, Friday, May 24 on the Cleveland Clinic Akron General Stage, featuring Crush, A Tribute to Bon Jovi with Victory Hwy. Nick Cave, whose exhibition Nick Cave: Feat. is currently on view at the Akron Art Museum, is bringing his dazzling, multifaceted art performance HEARD to Akron with two unique presentations of HEARD•AKRON. Follow Us. Like Us. Share Us.